Offering you a complete choice of products which include men branded jeans, men jeans pant and denim jeans. 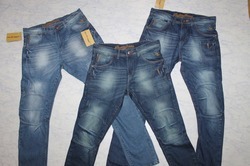 On the demand of our clients, we are devotedly engaged in offering an exclusive range of Denim Jeans. The entire range of jeans is made available in six different shades. Our jeans are treasured for denim pant style. Available in four different sizes of 30, 32, 34, 46. In addition to this, we make sure to customize these jeans to attain maximum level of client satisfaction. Looking for Denim Jeans ?